Rediff.com » News » Troll of the year: The man who parodied Subramanian Swamy! 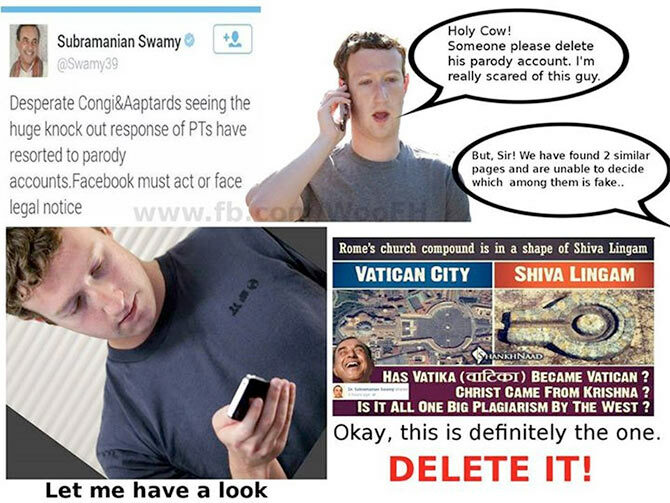 Troll of the year: The man who parodied Subramanian Swamy! Subramanian Swamy is generally regarded as The Man You Don't Mess With. Mango Indian interviews the man who parodied the Harvard-educated Indian politician, and lived to tell the tale. Anyone who has read a Rediff message board knows that the Internet is a funny place. For an article on, say, advice for new mothers, you can see people fighting over 'Southies' and 'Northies', or 'Sickulars and Chaddis' in the space below meant for discussion. There are also other examples in cyberspace to show that we the people of India have not lost our sense of humour. Yet. One such recent episode involves the redoubtable Subramanian Swamy, who wrote in 2001 about 'the creeping fascism of the Rashtriya Swayamsevak Sangh' (External link here), and who is generally now believed to be the messiah sent from above to rescue all Hindus from the evils of the West. Subramanian Swamy is generally regarded as The Man You Don't Mess With. Ask the Congress party brass why. So, in June this year, when a parody page of him cropped up on Facebook, eyebrows began to hit the ceiling. The parody page's posts were of the same kind as the 'official' page's: Linking everything on earth to Indian (read Hindu) origins. Monalisa was an Indian woman named Monali Shah, the parody page declared, William Shakespeare was actually Vilvan Sheshappa Iyer, and so on. Few noticed that this Swamy was Subramaniam, and not Subramanian. The original Mr Swamy was not amused. Congis and AAPtards were behind the parody page, he thundered to PTs (Patriotic Tweeple, his fans) on Twitter. Facebook must shut it down or face legal notice. 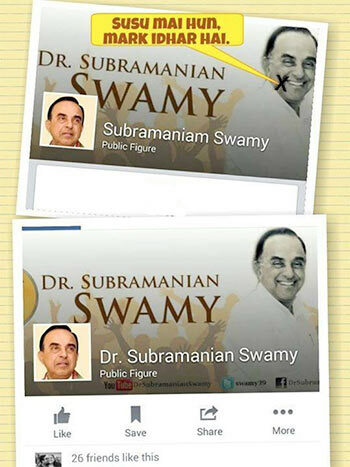 A couple of days later, Swamy's 'official' Facebook page disappeared, while the parody page lived on with a name change to Unofficial: Subramaniam Swamy. Turns out, the 'official' page was not run by Swamy, but by some 'patriotic Hindus' from America, calling themselves Shankhnaad. A sample article from Shankhnaad's lovely Web site declares murdered Pune-based anti-superstition activist Narendra Dabholkar was a fraud. handle, Facebook takes too much time so these guys run it with his blessings. So here's what must have happened: Facebook told both the parody page and the Shankhnaad page to add unofficial to their names because none of them is run by the actual Mr Swamy. The parody page did, Shankhnaad didn't. We spoke to the parody page's administrator who was celebrating 25,000 'likes' at the time of writing -- in a brief chat. Wouldn't want to reveal my identity. I am a software engineer currently working in India. Why did you start the parody page? Of late -- from one year -- I have been seeing Subramanian Swamy's page -- managed by Shankhnaad -- with lots of misinformation against Christians, Muslims, Hindus. And they try to prove it with Photoshopped pics. It was very disturbing seeing the educated lot sharing such info without thinking. That's when this idea struck me. I also follow Swamy on Twitter, and was aware of his tweeting style. So I created this page to show funny things and claim everything belongs to our ancestors. I didn't know it would click and grow so fast. When I started, it was football season. I tried to relate every good player/country to our Hindu ancestry. People knew it was fun and more people started liking our page. Later I came up with some more fiction like Santa Claus is Sanatan Kailash, Mickhel Jackson was Mai Ka Laal Jai Kishan, Mona Lisa was Monali Shah, Charles Darwin was Chenna Duraiswamy, etc. But many actually started believing it to be true and shared our posts. A few also complained to Swamy on Twitter, Which he initially ignored. But as we started updating more, he got annoyed and tweeted, threatening to sue Facebook. Have you ever felt threatened by Swamy's fans? I get lots of threatening messages from his supporters, but I also get lots of encouraging messages to continue. Yes, I am still worried, which is one of the reasons I want to remain anonymous. Where do you get the ideas for your posts from, such as Monali Shah? Most of the ideas are by closely following Swamyji, Shankhnaad and many such pages. Many of my posts are copied and modified from their pages. I am very happy to see the hate-filled page is now removed. Happy that my page was one of the reasons for it to be removed. But the credit goes to Swamy and his tweet. Commercial MNCs are checked, so why not religious MNCs?